Transforming these fifteen churches, monasteries and synagogues into homes, libraries and nightclubs hasn’t put a damper on their sense of reverence and grandeur. Former houses of worship all over the world retain all of their awe-inspiring original architectural elements like vaulted ceilings, arches, altars and stained glass windows while adjusting to needs that are more mundane. 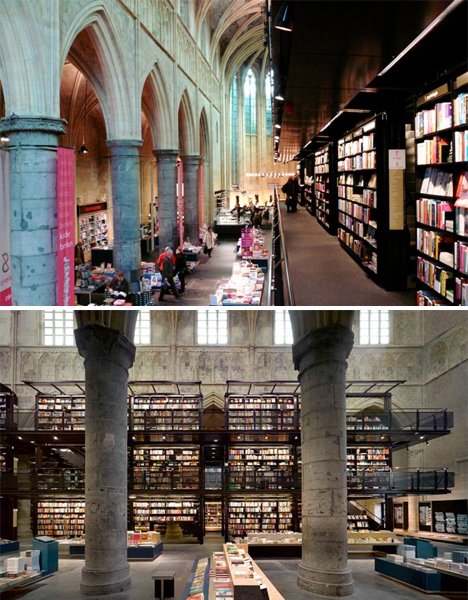 A thirteenth-century Dominican church in Maastricht, Holland has been transformed into Selexyz Dominicanen, a massive bookstore. 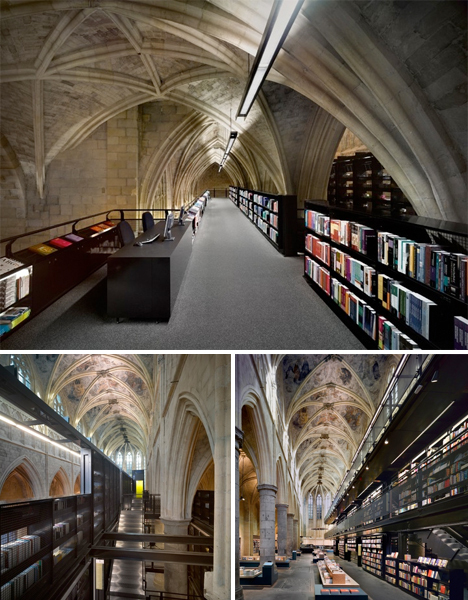 The 1,200-square-meter church will all of its elegant arches and vaults has been filled with a modern three-story volume containing row after row of books, to take advantage of the full height of the structure. 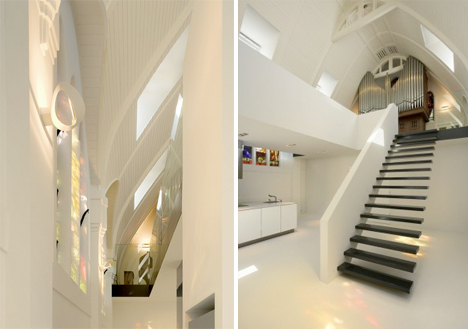 A modest, narrow chapel in The Netherlands that had fallen into disuse is now a private home. Like many other churches in the area, St. Jakobus was no longer needed for its intended purpose, so it was used as an antique store and even a meeting place for small concerts over the years. 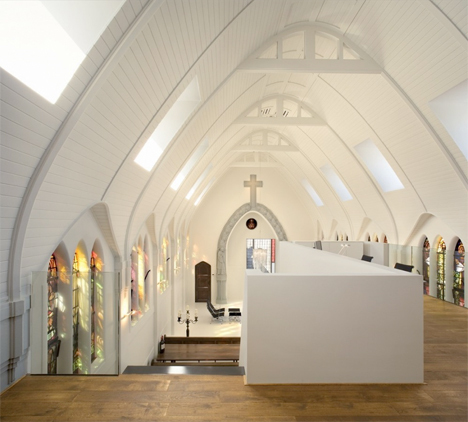 Then Zecc Architects came in, removed part of the mezzanine floor, painted nearly every surface stark white and inserted modular volume that provides enclosed rooms and a loft without compromising the grand feel of the space. Travelers can take a different sort of comfort in a 15th century monastery in Maastricht than that for which it was originally built. The Crutched Friars is now the 60-room Kruisheren Hotel. 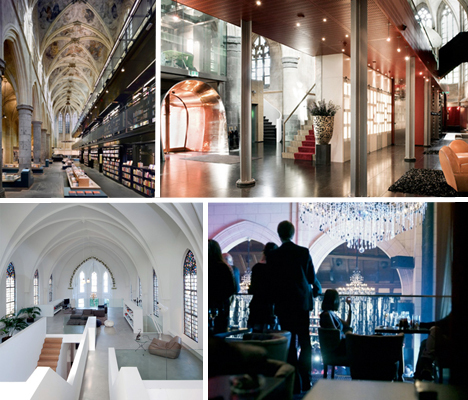 The monastery houses the guest rooms, while the Gothic church contains the reception area, conference rooms, a library, a boutique and a coffee bar. 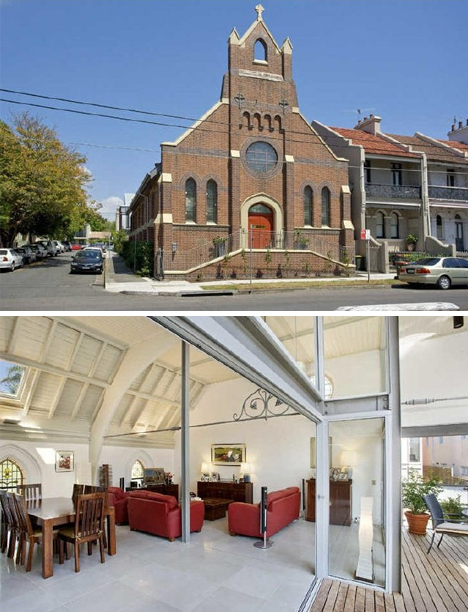 What appears to be an ordinary church in Sydney, Australia is actually a modern home. 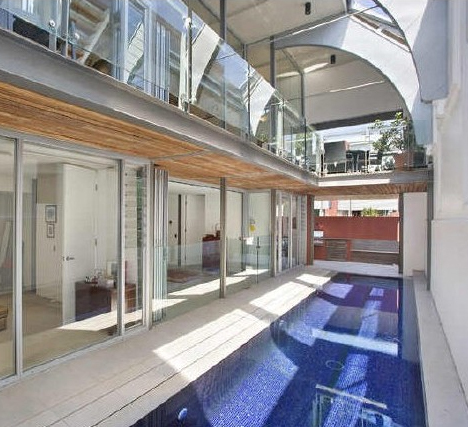 You wouldn’t guess from the outside that just within those walls is a light-filled living space with an indoor swimming pool, glazed walls and a marble commercial kitchen. 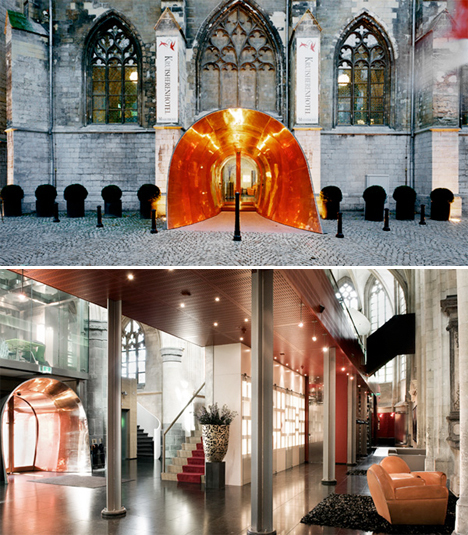 The Spirito-Martini is a luxurious hotspot in Brussels with three bars, five different lounges and a private room, all set within a former Anglican church. All of the major architectural elements of the church have been retained, including extravagant chandeliers. 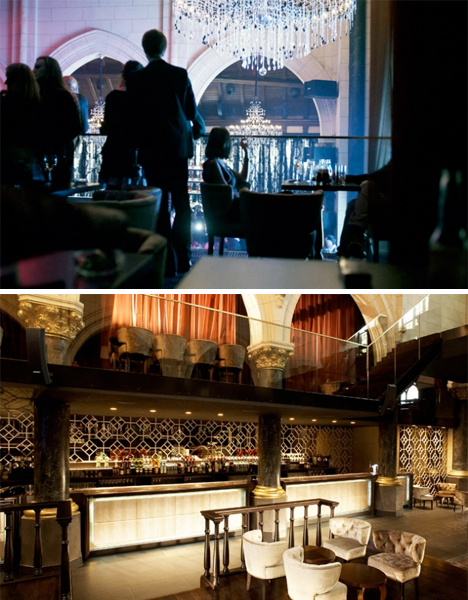 The designers outfitted the club in Victorian-style furniture, damask and dark wood.